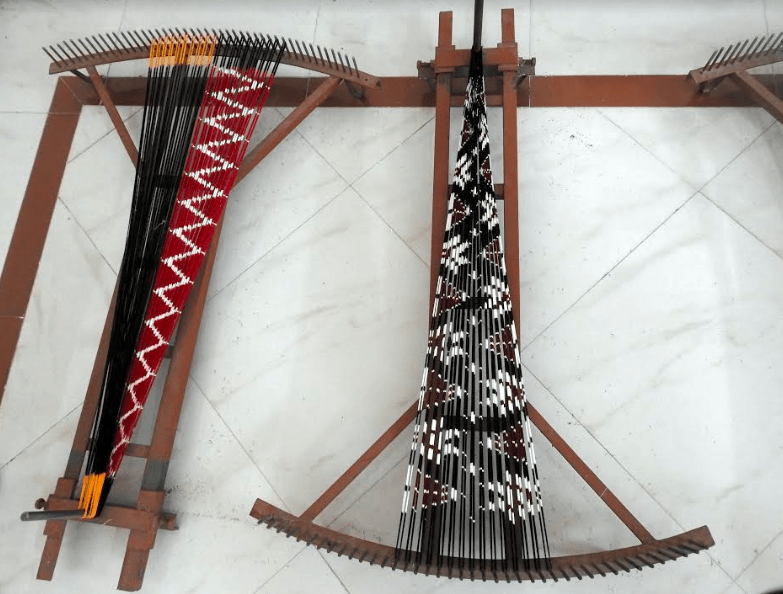 A small village off Hyderabad is taking small but sure steps to resurrect the art of Ikat by reinventing the wheel quite literally. A drive through a beautiful countryside road in Telangana throws up many surprises that soothe the urban soul. I was headed on one such road, when I spied a lake full of birds that was the perfect precursor to my destination Pochampally an important Ikat weaving center in South India. Referred to as Bhoodan Pochampally after Acharya Vinoba Bhave’s Bhoodhan movement, this place happens to be the first village to be created by this movement. Ikat is a geometric design using the tie and dye technique where the warp, weft or both are tie-dyed before weaving to create designs on the finished fabric. The weavers still weave designs that are typically traditional. These are woven in the villages of Pochampally, Koyalgudam, Chowtuppala, Chuigottala, Galteppala Srirpuram and Bhubangiri. Incidentally the village of Pochampally has over 5000 looms and specialises in the technique of double Ikat where weavers transfer the intricate designs and colours onto warp and weft threads first and then weave them together. Weaves are done using cotton, silk and silk cotton fabrics and colours are from natural sources as well as chemical dyes. What makes Ikat designs unique is the fact that instead of dyeing the fabric each thread is dyed in a pattern and woven in accordance with the design into the cloth which gives the fabric a unique character and the finished product is identical on both sides! The Pochampally saree incidentally, has received a Geographical Indication (GI) status in 2005. The looms used in Pochampally include pit and frame looms where the weaver sits with his or her legs in a pit that has two pedals that open the warp threads allowing the weft to shuttle used for shuffling the thread to pass through freely. Pit looms are popular as they need less wood to build them and the weavers’ hands are free to pass the weft shuttle from side to side and to compress the weaving as they go. The speed of a pit loom is relatively more compared to weaving on a frame loom. Frame looms on the other hand are made of rod and panels fastened at right angles to construct a form similar to a box to make it more handy and manageable. This type of loom is now popular now due to its portability. The different kinds of weaves here include Single Ikat Akshara design which is a close knit detailed design and the Single Ikat Mungi design, a plain design. Other designs include the Double Ikat Onku Design, Combination Ikat Chepa design which is a fish pattern and Silk Teliya Rumal. The Government has initiated the Integrated Handloom Cluster Development Programme, sponsored by the Ministry of Textiles. Thanks to this, the Telia Rumal sarees are seeing a revival from obscurity. The Pochampally Handloom Weavers Co-operative society Ltd. and Andhra Pradesh Cooperative Organization (APCO) helps in marketing the fabric. While in Pochampally, a must visit is the Handloom Park set up by the Union Ministry of Textiles home to 400 weavers who not just weave sarees but also quilts, bed spreads, table covers and bags. To add a contemporary sheen, there are modern designs that are also woven by taking inputs from the team of designers. This center is open to the public and can be visited where you can see the weavers at work. If you strike a conversation here, the weaver can actually take you to his home, where if lucky you can buy some of their weaves at a good price. A lot of weavers also work from their homes and walking along the narrow lanes, you will see that almost all homes here have a loom which is also a means to encourage women to become financially independent. “The technique is unique where tie dye is combined with weaving. The art is popular in various cultures which add to its wide reach. The patterns fit into a classy decor and lends a dressed-up bohemian vibe to interiors,” avers Vaishali Sinha, Founder, VLiving. The weavers of Pochampally are however facing many challenges including low wages and there is a steady dwindle in the number of weavers. A simple Ikat saree takes four days including the pre loom process. “The silk yarn is light and easier to dye and weave apart from the fact that it earns a higher margin. The cotton yarns are heavy and need more time to be dyed and woven. The dyeing is more tedious and needs chemicals like sulphates and in spite of this margins are very low. So I am not keen my young children take to this profession. Also power looms copy our designs and sell at lower prices so we face a lot of issues,” says Mallesh, a weaver from Sri Gurudutta Ikat Sarees in Pochampally. The weaving community is fast shrinking and the average income of a weaver of cotton sarees is about Rs. 8500 per month and silk sarees weavers make Rs. 12500 per month. Apart from the Government initiatives, the fabric is seeing renewed interest with expansion into the lifestyle space. Mala Sapra, Founder of Cottons And Satins says, “Ikat is a very versatile technique and is frequently interpreted as prints, which is what we specialize in. Our love for Ikat stems from its versatility. 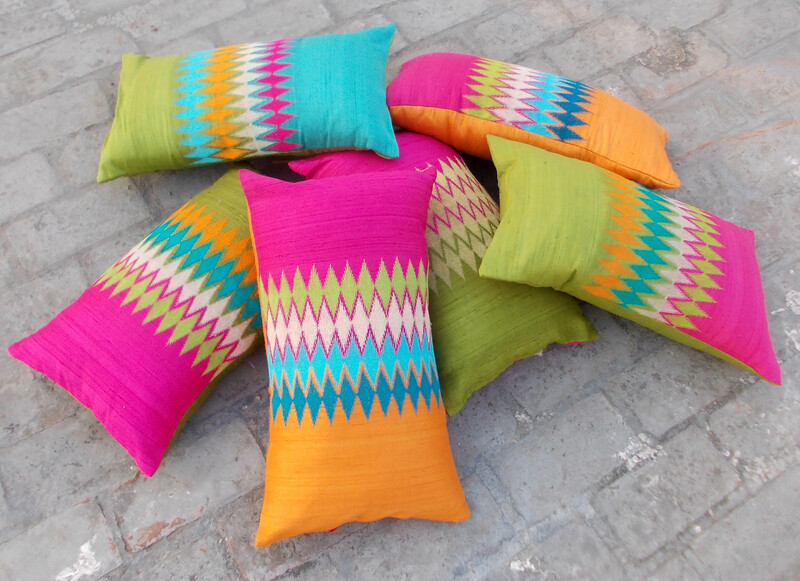 Within the various styles of Ikat you can have bold motifs or geometrical looking styles. These exotic motifs with ancient roots are perfect to energize furnishings and accessories and offer a different style element.” While all this is helping the industry, there is much more that needs to be done. After all our weaves are our heritage and it is vital to take action now to keep these traditional weaves alive. So the next time you are shopping make the Ikat choice, they are classy and comfortable and you will be helping a weaver smile too! It takes four days to weave one Ikat saree from the pre loom process. 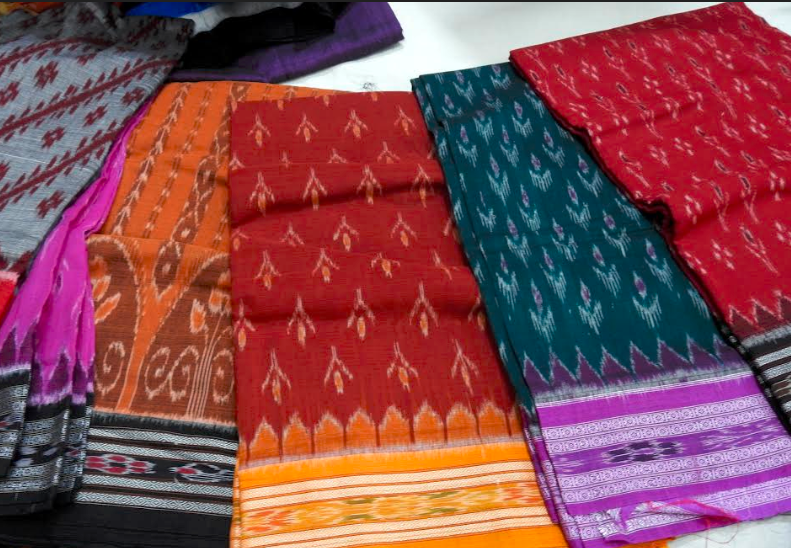 Gujarat’s famed Patan Patola weaves are also a form of Ikat and a saree can take several months to weave and will lighten your wallet by a few lakhs. 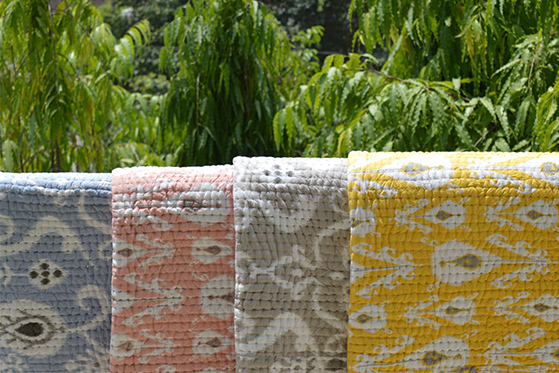 Orrisa’s Ikat uses resist dying method that is akin to tie and dye and is mostly done in Bargarh, Sambalpur and Sonepur. Indonesia, Japan, Argentina, Bolivia, Mexico and Guatemala are other countries that work on Ikat fabrics.